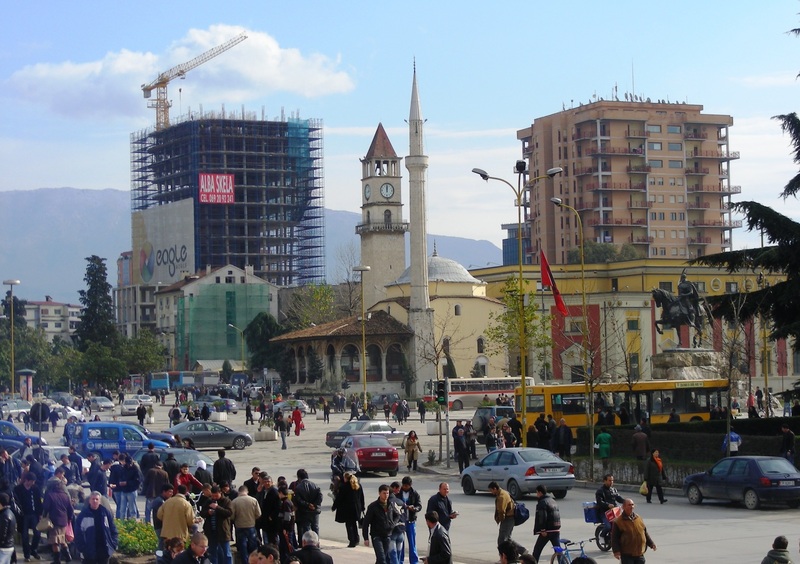 Next week, I’m leaving Britain to spend a month in the second of my three cities – Tirana, the capital of Albania. As with the other cities I’ve chosen for my research into a state-of-Europe book, it will be my first time there – something which will help me to see the place with the fresh eyes of the travel writer. And Tirana, for reasons of history, politics and geography, is even less-known to the average traveller than the other two cities. Albania has a special place on my list of countries-I-have-never-visited. In 1988, I embarked on a kind of communist interrail trip, a complicated adventure around Eastern Europe involving visas which specified your entry and exit to the hour, daily currency allowances, and meals in restaurants that served only potatoes and one kind of meat. But we – yes, I’d even persuaded a long-suffering friend to go with me – didn’t go to Albania which, ruled by uber-communist Enver Hoxha for the past forty years, was considered the world’s most isolated state. The only way westerners could visit was on an organised tour, guarded by official tour guides and watched by the Sigurimi to make sure they didn’t contaminate the local population with capitalist ideas. Over three decades later, I’m finally going to Albania, lured by the country’s reputation for friendliness as well as its sheer singularity. These days, it’s a democracy which actively encourages tourism as a way of building its under-developed economy – see here its latest promotional campaign under the rather ambiguous title Taken by Albania. As an aspiring member of the EU, Albania raises some interesting questions about what it means to be a modern European state. With a Muslim-majority population, it has a tradition of religious tolerance which pre-dates the banning of religion under Hoxha. Albanian – which I haven’t attempted to learn – is unrelated to any other European language. The code of honour (‘besa’) observed by clans in mountainous areas lives on, I gather from UK-based Albanians, in cycles of revenge killings as well as a strong tradition of hospitality to foreigners. Tirana, while lacking infrastructure such as a train station, is now a kaleidoscope of brightly-painted buildings and cafes, with a vibrant arts scene and night life. It’s trying hard to be a cosmopolitan continental city. Will I be taken by it? As with my time in Cadiz, I’ll be sharing some first thoughts and images on social media, especially the Facebook page Evolving Europe, and sending subscribers to my newsletter some traveller’s tips about Tirana on my return. You can sign up to receive them below. ⟵The Idea of Europe: Out of print in the United Kingdom?